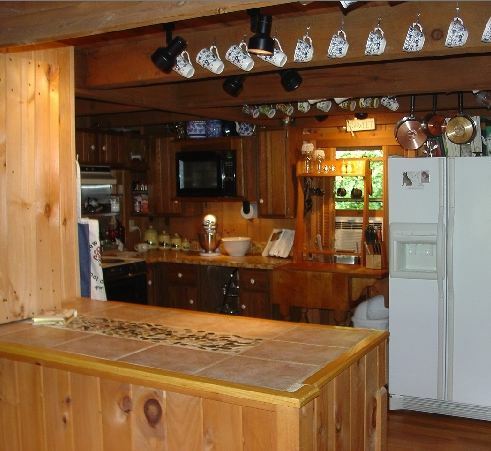 This is what we’re dealing with: a fifty year old summer cabin, with a kitchen squeezed in where it would fit. Later, the original builders (a truly delightful couple, Pug & Mickie Pugmire, who could make me laugh until my face hurt) added on to make a spacious home, but the kitchen remained the same – hardwood floors, odd corners, low ceilings, exposed beams, mismatched cabinets, and a charm that I find so appealing that I never want to settle for another dry-walled boring kitchen as long as I live. Oh yeah! The kitchen! And Organization! Here’s what’s happened thus far. Every single thing has been dragged out of the cabinets, the cabinets cleaned, the stuff cleaned, and it’s ready to go back in the cabinets. (And in case you’re wondering, NO it doesn’t all fit, if you try that. It’s like putting something mechanical back together. There’s always that extra screw lying around, making you wonder where the heck does THAT go… ) Meanwhile, every item is subject to Letitia’s brutal scrutiny. “Do you need this? Do you use this? How often do you use this? Should it be in storage? Do you want to donate this? Surely you don’t need THAT.” I’m telling you, that woman is worth her weight in gold. We’ve weeded out and removed and consolidated and donated all over the place. Everything finishes going back in, today. Most everything is back in place. The remainder has been allocated its proper space. And while we’ve uncovered treasures (my organization skills lend themselves to the occasional Christmas-like, ‘Oh wow, I forgot I had this!’) during this process, I do believe the angels sang when we found ourselves with that most treasured of all things, in a kitchen: a completely empty cabinet. Seriously. There is one cabinet that nothing is slated to fill. Three shelves. You can’t tell me that’s not a treasure. (There’s not one person reading this, who’s got a kitchen and uses it, that wouldn’t love to have just one more cabinet.) And it’s killing me, here. I mean, I can’t just LEAVE it empty, for heaven’s sake. And Letitia won’t let me put anything useless in it. There’s only one thing to do. I just don’t see any other option. I’m going shopping. This entry was written by The Wedding Fairygodmother, posted on June 3, 2011 at 8:45 am, filed under breakfast, cooking, food, smoky mountains and tagged bed and breakfast, cooking, inn, kitchen. Bookmark the permalink. Follow any comments here with the RSS feed for this post. Both comments and trackbacks are currently closed.